ONLY 7,173 Miles! Heated Seats, Satellite Radio, Back-Up Camera, CD Player, Brake Actuated Limited Slip Differential, Dual Zone A/C, 4x4, CHARCOAL BLACK, HEATED UNIQUE CLOTH F... WHEELS: 17 SPARKLE SILVER-PAINTED AL... READ MORE! 4x4, Back-Up Camera, Turbocharged, Satellite Radio, CD Player, Dual Zone A/C, Brake Actuated Limited Slip Differential Rear Spoiler, Keyless Entry, Privacy Glass, Steering Wheel Controls, Child Safety Locks. SE SYNC 3 PACKAGE SYNC 3 Communications & Entertainment System, enhanced voice recognition, 8 LCD capacitive touchscreen in center stack w/swipe capability, AppLink, 911 Assist, Apple CarPlay, Android Auto compatibility and 2 smart-charging multimedia USB ports, SYNC Connect, remotely start, lock and unlock vehicle, schedule specific times to remotely start vehicle, locate parked vehicle, check vehicle status and Wi-Fi hotspot connects up to 10 devices, service for 5 years, CHARCOAL BLACK, HEATED UNIQUE CLOTH FRONT BUCKET SEATS 10-way power driver seat (includes power lumbar and power recline) and 4-way manual front passenger (fore/aft w/manual recline), WHEELS: 17 SPARKLE SILVER-PAINTED ALUMINUM (STD). 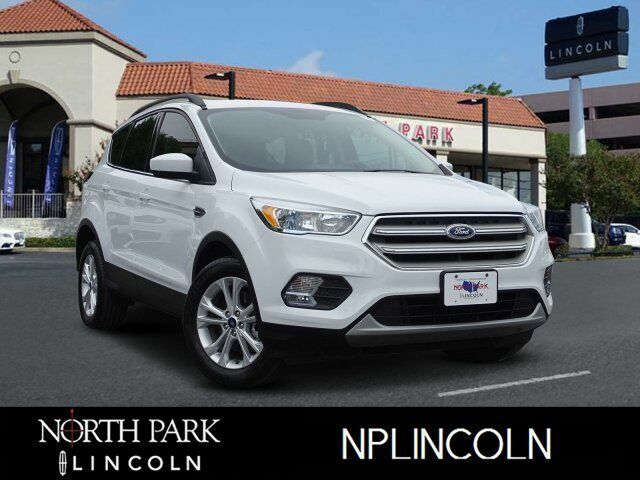 2018 Ford Escape with Oxford White exterior and Charcoal Black interior features a 4 Cylinder Engine with 179 HP at 6000 RPM*. CARFAX 1-Owner Edmunds.com`s review says Brake performance is solid and consistent. The Escape is very stable, even during our panic-simulation stop tests. In everyday driving, the brakes offer linear response and feel..